‘Because of small and avoidable money problems, people’s treatment either stalled or stopped.’ This statement on page 7 explains why this article is our cover story this issue. 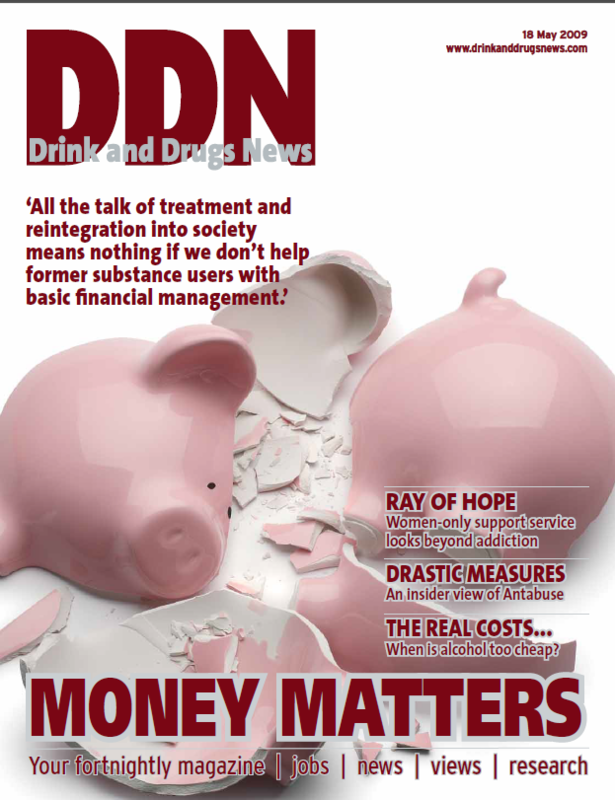 The Both Sides of the Coin project attempted to bring representatives from mainstream financial organisations together with the drug and alcohol field to debate practical ways of bringing basic financial management to those most in need of a leg-up from poverty. It’s not an easy exercise, hampered by prejudice and inertia, but at least the word’s going around that practical steps are within reach. Credit unions are a viable option to tell clients about – yet many drug and alcohol workers are unfamiliar with the way they work. Read the article and pass on the essentials. As alcohol debates rage on (where they can get a look in in the press at the moment) the government has launched its public consultation on what should be included in its mandatory code of practice to tackle irresponsible drinks promotions (page 4). Yet it has already declared that it will not introduce the minimum price per unit, despite all the recent evidence that raising alcohol prices cuts alcohol-related hospital admissions. Alcohol Concern are among the campaigners that must be feeling like they are banging their heads against a wall constructed by a hysterical media – will government ever follow public health evidence to its logical conclusion, or will the ‘nanny state’ jibes continue to keep them blowing in the breeze of public opinion (page 8)? There’s more evidence that caring and consistent key-working makes all the difference on page 11, where John gives a service user’s perspective of the criminal justice system, and there’s a reminder from Daren Garratt (page 9) that an inconsistent approach to keyworking can not just hold back service users, but sabotage their progress so far – a timely reminder that no amount of cost-cutting can compensate for good workers who know what they are doing.